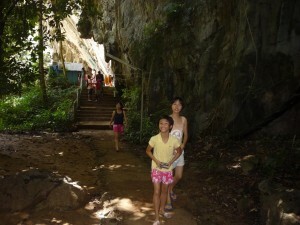 Browse > Home / Reviews / Drive To Krabi – Day 3. 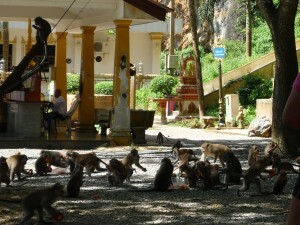 Drive To Krabi – Day 3. 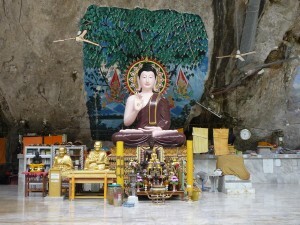 After breakfast, we drove to Wat Tham Suea or Tiger cave temple about 15KMs from Aonang Beach. According to our travel information, the cave was discovered by a monk who wanted to meditate and noticed tigers roaming around the cave, so he named the cave – Tiger Cave. 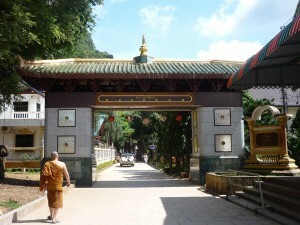 This is the entrance to the temple. 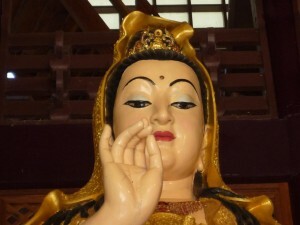 I was quite surprised when I have glance at the wording, this is a God of Mercy Temple ( Guan Yin in Mandarin ). 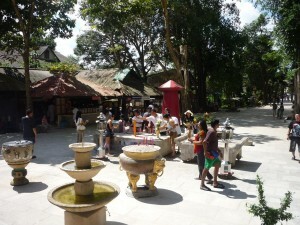 Follow the road for about 100Meters will bring you to the temple where it house the Guan Yin Statue. 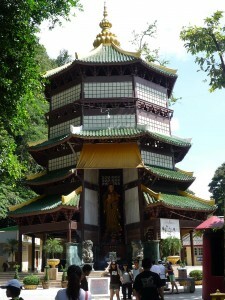 At the end of the walk way, you will this pagoda housing a huge Guan Yin Statue. A very important reminder here, there are a lot of monkeys around the area, please take good care of your belonging or it will be hijacked by the monkey – like Zheng Er’s bottle, disappear in a glimpse of an eye. Put everything into your carrying beg, try to avoid holding a plastic bag. 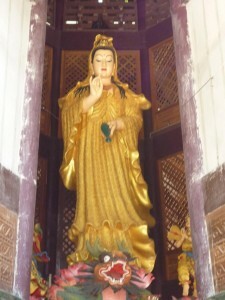 The Guan Yin temple is located at the foot hill, there are 2 places that you can venture to from here : the tiger cave and the view point on top of the hill. Please take note that there are 2 different routes to both destination. 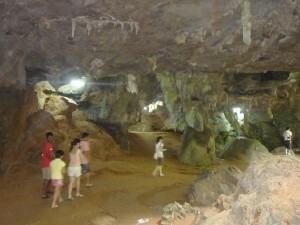 We choose to explore the cave. 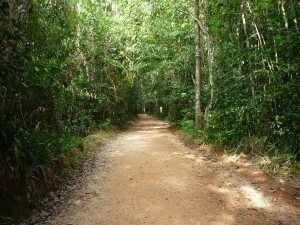 In the beginning of of the trail, it clearly stated that this is not the trail to the hill top to avoid confusion. You wouldn’t want to waste your energy as the trail to the top of the view point is about 1200 steps, about 4.5 times of Batu cave, Kuala Lumpur, Malaysia. 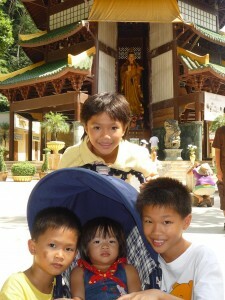 Zheng Hao, Zheng Ni, Jia Chi, Zheng Yuan and Jia Yiin posting before the tiger cave trail adventure. 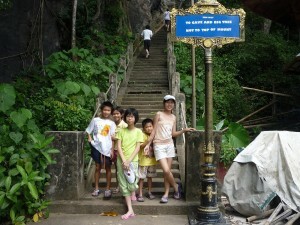 We do not hire a tour guide so basically we do not not what to expect and where exactly is the tiger cave, we are hopping that there are sign board lead us to the tiger cave. This is the first sight after we descending downhill. 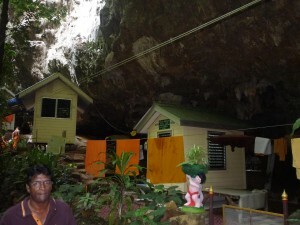 I believe these huts are staying by the monk who meditate here. There are a lot of cave as we walk along the trail, but unfortunately no clear sign of telling us which one is tiger cave. Anyway, we just enjoy the company of the natural environment. 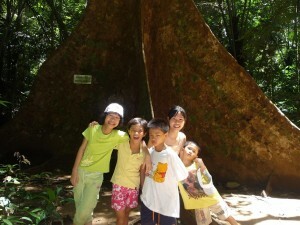 Big tree is very common in the jungle trail. 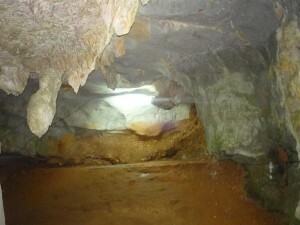 We walk for about 30 minutes, passing several caves and still not clear sign of tiger cave, we decided to turn back, may be we just missed it or the cave was not properly tag with sign board. 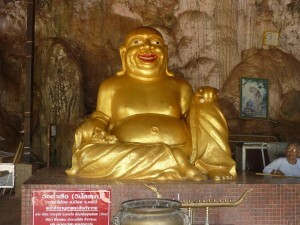 One of my favorite, Laughing Buddha statue in the temple. 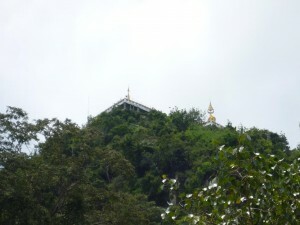 After we return to the Guan Yin temple at the foot hill, Car 6 and car 8 decide to challenge the hill top. As I mentioned it is about 1200 steps, so I decided not to take up the challenge. 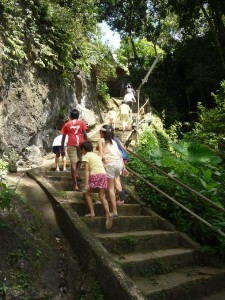 Wai Chee decided to give it a try with the kids, they return after completed about 200 plus steps. It took Car 6 and 8 more than an hour to complete the trail. If you are physically fit, you should give it a try and the view on top of the hill is just superb. 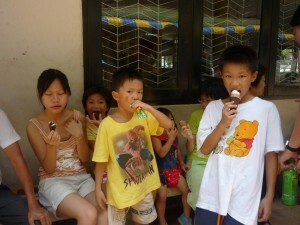 Even the kids did not make it, they are all rewarded with ice cream. 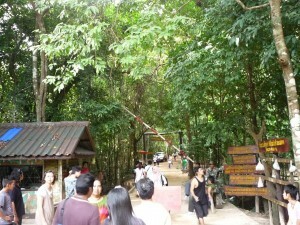 From the ground, you can see the viewing deck on top of the hill. 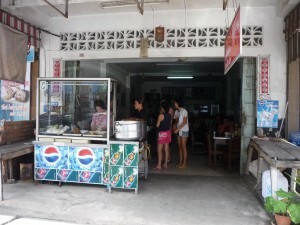 Its about 1.30pm, we are hunting for food at Krabi town about 5Km away. 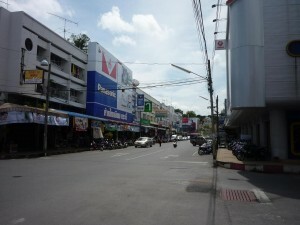 Krabi is small town and quiet during our visit. 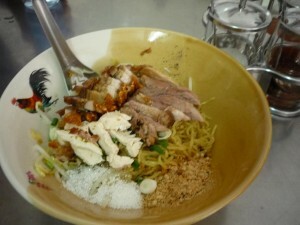 However, you may visit the night market here where you can find a lot of local foods. 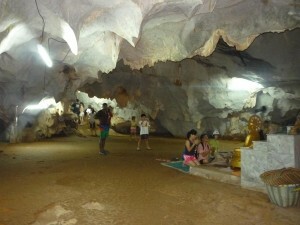 Since we stay at Aonang beach, about 30Kms from Krabi town, decided not to visit the night market. We parked our car and roaming around the town and discover this coffee shop, since it is 2pm, not may choice available. We ordered some rice and noodle with roasted pork and chicken. Do you notice that they put sugar in the food ? 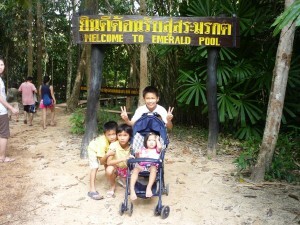 After lunch, we decided to visit a natural tourist destination call ” Emerald Pool”. It is a last minute decision so some team member did not bring additional clothing to enjoy the fun at Emerald Pool. By listening to the name, you will know it is a pool with emerald like colour water. 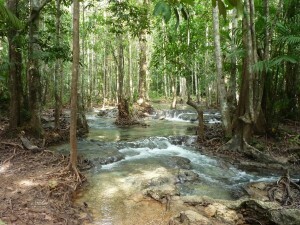 The water is originates from a warm stream in the low land forest of Khao Nor Juji. The colour of the pool water change from time to time according to the weather and time of the day. 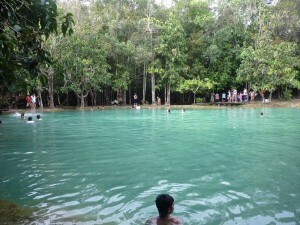 About 50 KM from Krabi, Emerald pool is located at Khlong Thom town along highway 4. 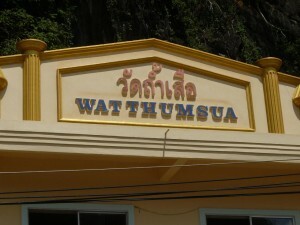 Turn at Khlong Thom town junction to road 4038 towards Lam Thap. 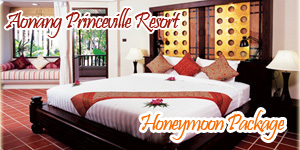 About 100 meters from the junction, you will notice a white signboard on the right leading you to Emerald Pool, Hot Spring and a wild life sanctuary. 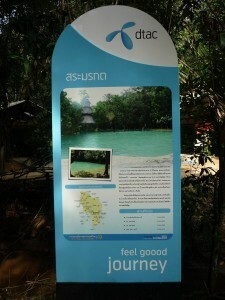 Please take note that the sign board indicate Crystal Pond instead of Emerald pool. About 15KM from road 4038 junction, we arrived at the Emerald Pool or crystal pond. You need to pay about 50Baht for each car parking. At the entrance, you need to purchase ticket before you can enter the area, it cost only 20Baht for local but 200Baht for foreigner. 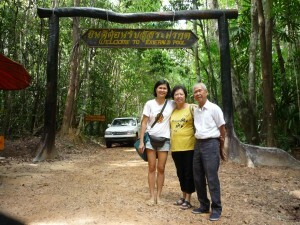 Wai Yee and parents at the entrance of the park. Even at the entrance of the park, you can see the beauty of the stream with emerald like colour. 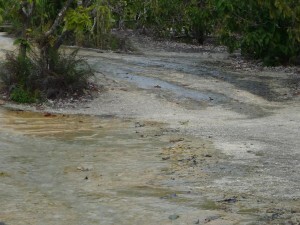 After purchase the ticket, you need to walk about 1.5Km to the actual Emerald pool via this gravel road. The road is well under shade by a lot of trees. Finally we arrived at the Emerald Pool. 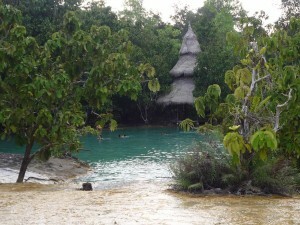 Interestingly, it is indeed an Emerald pool, first in my life. Be very very careful when you walk around the area, it is very very slippery. Zheng Yuan can’t wait to jump to the pool. Jia Chi enjoying the natural slide to the pool. 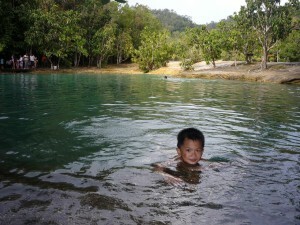 We spend about an hour at Emerald pool and reached Aonang beach about 6.30pm. Again too late to enjoy the sun set. 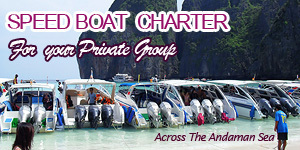 I hope I can make it tomorrow as we only plan for Island hopping trip tomorrow. No more seafood tonight as we decided to try out some local food. 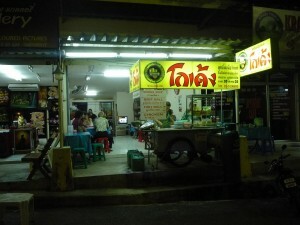 We found this small food stall selling noodle not far from our hotel. ( It is at a small lane opposite McDonald ). I strongly recommend you try this stall, it cost about 35Baht per bowl, but you need 2 to 3 bowls to fill your stomach as the portion is very small, a few meat ball and 3 – 4 mouth full of noodle, that is. After dinner, shopping and massage again.